Yep. I got that in the mail. Apparently it's in NoHo. I immediately threw it in the recycling. 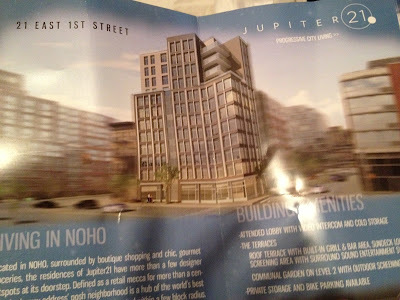 Maybe the promo writers for this monstrosity and those for the Jefferson should square off; the Jupiter mailing placing it in Noho suggests the EV is not cool enough to contain an edifice of such magnificence, yet those of the Jefferson posit the exact opposite. Bring it on! It won't be considered Noho by anybody except Jupiter 21 PR flacks and snobs living there. From the brochure: "Defined as a retail mecca for more than a century, the luxury address' posh neighborhood is a hub of the world's best clothng, furniture and food shops" -- destroy the past, then claim it as a heritage. Pimp history for a whore. I wonder if the copywriter feels clever or disgusted. I got it too. I was thinking that maybe The New Yorker sold them their subscriber's list. "Posh neighborhood"?!? Who is going to fall for that? NoHo extends up through Quebec to the Northwest Corridor, what's your problem folks? And don't get me started on SoHo, but it gets very, very cold down in Antarctica. Right on, Rob. It's obnoxious the drivel these RE developers come up with. It would be funny if it wasn't so lame. 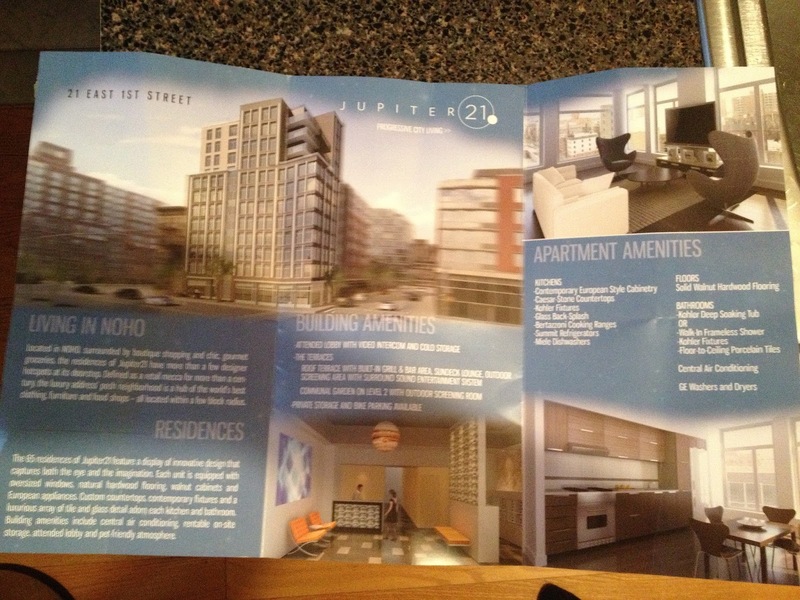 I also noticed there wasn't *any* mention of prices–which of course mostly likely means, as my dad says "If you have to ask you can't afford it"
Grieve - do an update - I just got a new one in the mail that says "East Village" instead of NoHo in the same spot! Ha!